The iPad is basically never on sale, but right now Apple is offering the best prices seen yet on refurbished iPad models. The iPad Wi-Fi models are especially cheap at up to $100 off. Now here’s why this is an extra great deal; the refurbished iPad models all include brand new batteries and brand new outer shells, plus they include the same 1 year warranty that new Apple products get and are still eligible for AppleCare Protection Plans for iPad . The refurb iPad 3G models are are all just $50 off, making the WiFi model a particularly strong deal. Grab one of the refurbished models at a deep discount and then grab an iPad AppleCare Protection Plan for just $75 ($25 off) and you’ll basically have a new iPad with a full 3 year warranty! I like AppleCare extended warranties in general but I think it’s particularly wise to get the extended warranty when buying refurbs. 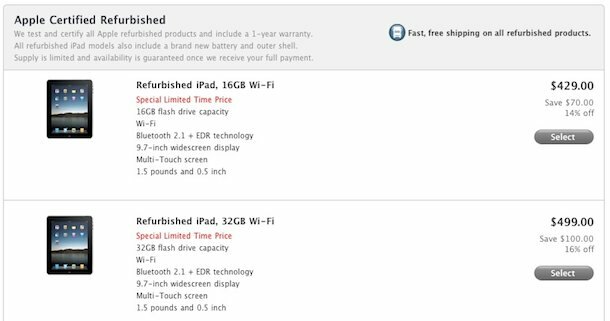 You can check out the refurb iPad sale on Apple’s website, supply is limited and I bet these will sell out quick at these prices. Aren’t these prices the same nmbers as new iPads in UK sterling?